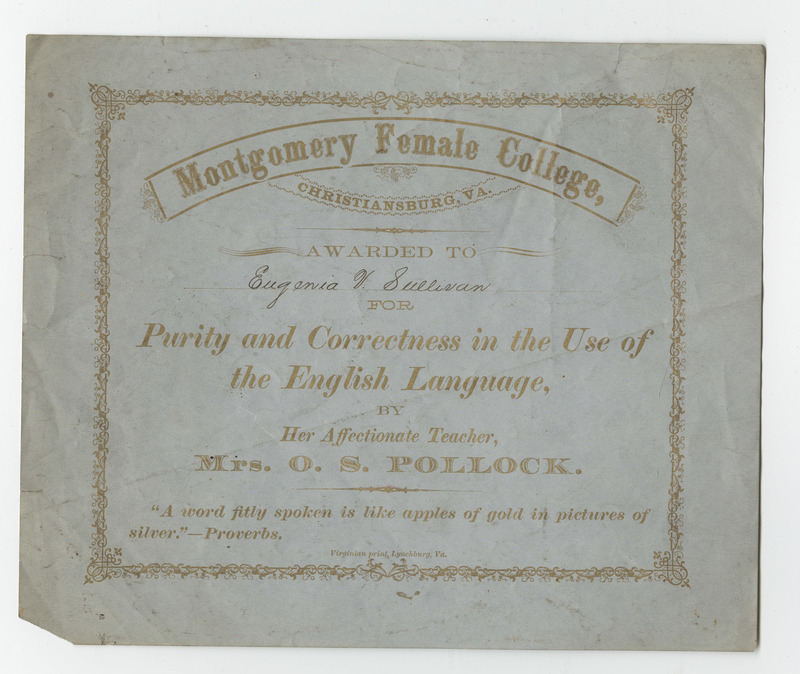 Founded as a companion to the Montgomery Male Academy, the Montgomery Collegiate Institute - later Montgomery Female College - opened in Christiansburg Virginia on November 1, 1852. The school was sold at public auction to Oceana S. Pollock, a teacher at the school, in 1876. In 1903, Pollock's niece, Virginia Wardlaw was named principal of Montgomery Female College. Her sisters soon followed, they gained notoriety for their odd behavior over the next few years. Montgomery Female College closed in 1908. 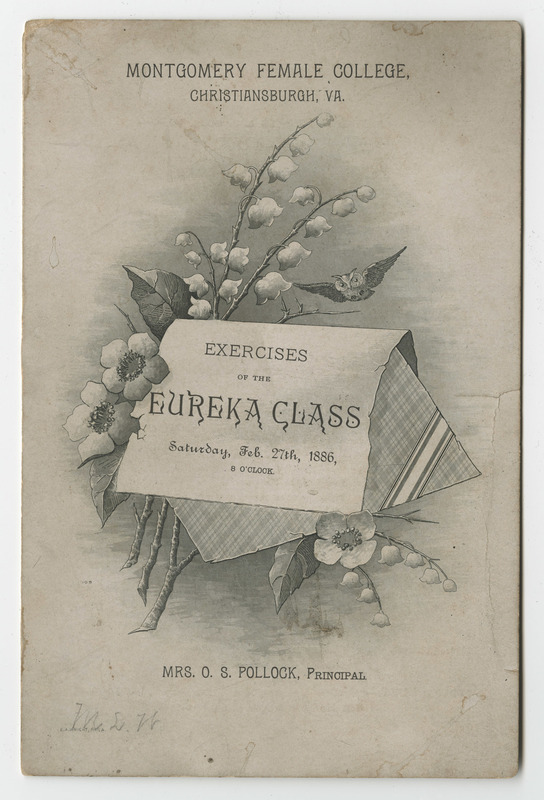 The collection includes a program for exercises of the "Eureka Class," also listing the class' individual members. Also included is an 1892 program of entertainment including recitations, music and songs. Two undated certificates, awarded to Annie V. and Eugenia V. Sullivan for "purity and correctness in the use of the English language" are included as well (Eugenia V. Sullivan is listed elsewhere as a member of the class of 1886.). An additional item was donated in 2014: the 1875-1876 Annual Announcement. See the finding aid for the Montgomery Female College Collection. 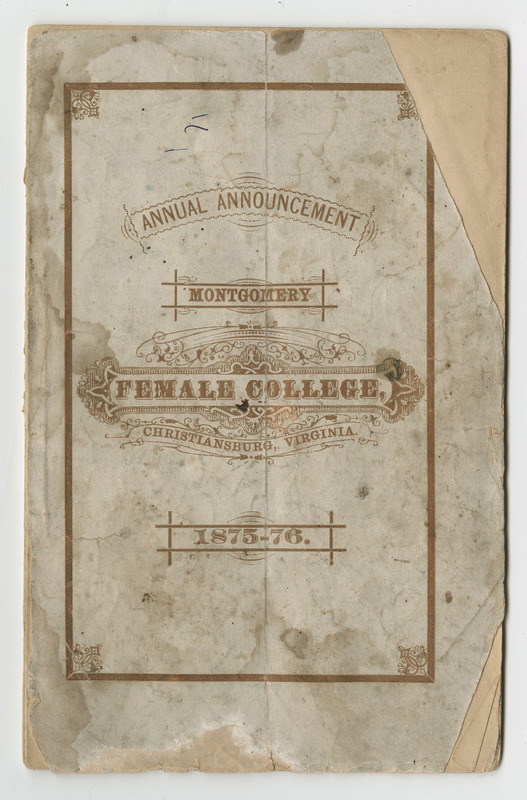 Permission to publish material from the Montgomery Female College Collection must be obtained from Special Collections, Virginia Tech. Collection is open to researchers. Researchers wishing to cite this collection should include the following information: Montgomery Female College Collection, Ms2009-013, Special Collections, Virginia Tech, Blacksburg, Va.
Montgomery Female College certificate "awarded to Eugenia V. Sullivan for Purity and Correctness in the Use of the English Language"
Program lists the performance exercises of the "Eureka Class", including recitations and recitals, as well as a list of students.